How can I integrate it with Customer.io? During the sign-up process, you will get to the "Integrations" step. Here you can find the whole list of the available integrations. 2. You will see a link. Copy it. 3. Now go to your Customer.io dashboard and click on “Integrations” tab. Choose Email Activity Webhooks. 5) Click “Save”. You are ready to go! Come back to Quokka and connect your integration. In the current version of Quokka, for ActiveCampaign we support all the types of its campaigns. Important: we are using webhooks for this integration. 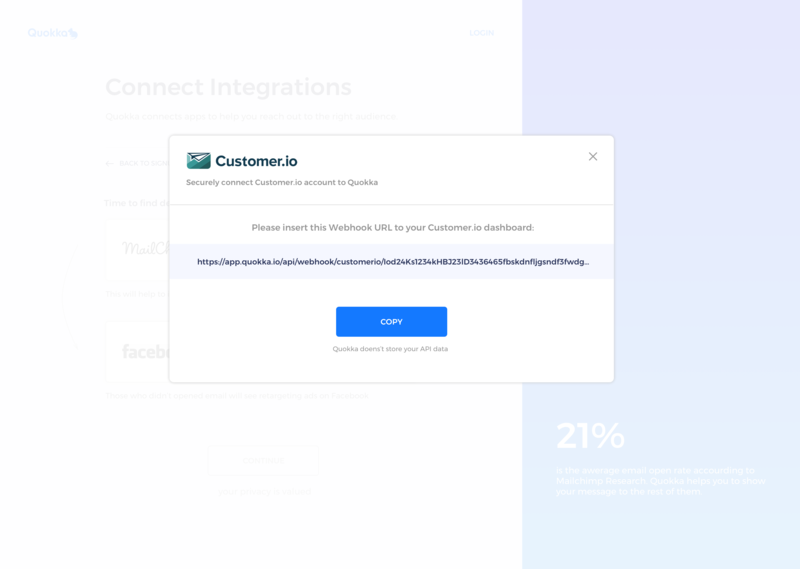 It means we will detect and update audiences only when you add Quokka as integration and send your campaign after it.